Beach Bums is a bicycle, paddle board, and kayak rental business located on Anna Maria Island. They wanted a fresh new look and a mobile friendly website to accommodate tourists who search for local businesses on their phones. We redesigned their old website which was not responsive, and built them a more modern, full featured WordPress website integrating large animated layer-sliders on the home page. 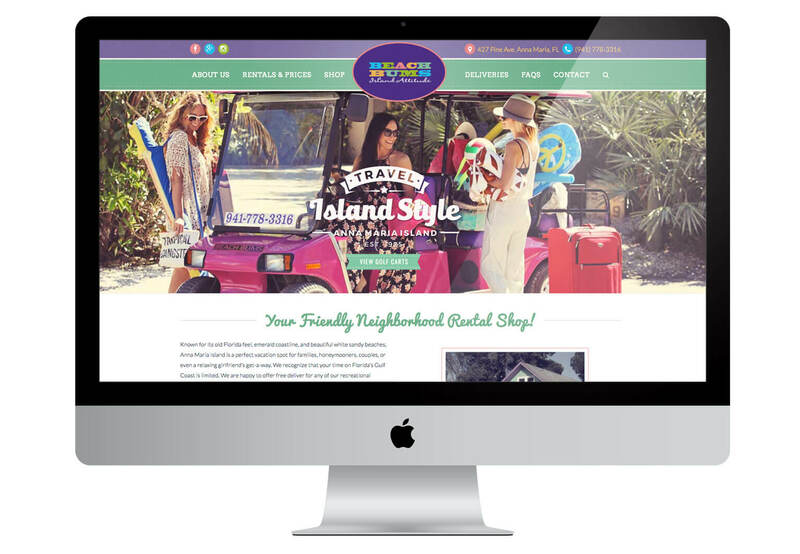 Beach Bums wanted a one-of-a-kind design to reflect their unique business and to set them apart from other rental companies on the island. Our design was heavily customized to give users a vintage feel. Customers may view the company’s rentals, prices, and more. Since Beach Bums’ new website is built upon WordPress, the flexible and most popular Content Management System, an admin can easily update prices and manage the website. This local business also wanted to show off their excellent reviews, so we incorporated sliding testimonials into their website. In addition, we provided our local and advanced Search Engine Optimization services to get them ranked higher in search engines.